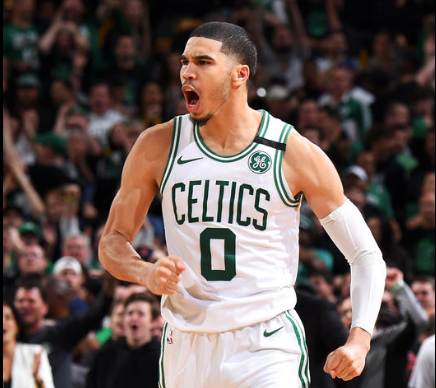 By now, we've all seen the tweet from a young Jayson Tatum asking LeBron James for a follow on Twitter Jayson mentions in the first video below. Even still, when you look at the little kid, dwarfed by LeBron in the attached photo, seeing Tatum dunk all over James in the present is...well, weird. And also pretty satisfying - even therapeutic, to tell the truth, after the Boston Celtics' loss to the Cleveland Cavaliers and LeBron in the 2018 Eastern Conference Finals earlier in the week. 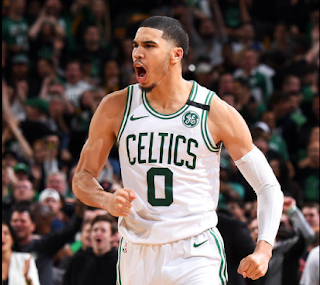 Watch the videos below to here Tatum's thoughts about facing off against one of the stars he grew up watching - and to see a detailed example of one such dunk in question broken down into a cool three-hundred-and-sixty degree perspective for what NBC Boston is calling a "dunk of the year" candidate - I'd have to agree (though the win would have been better).